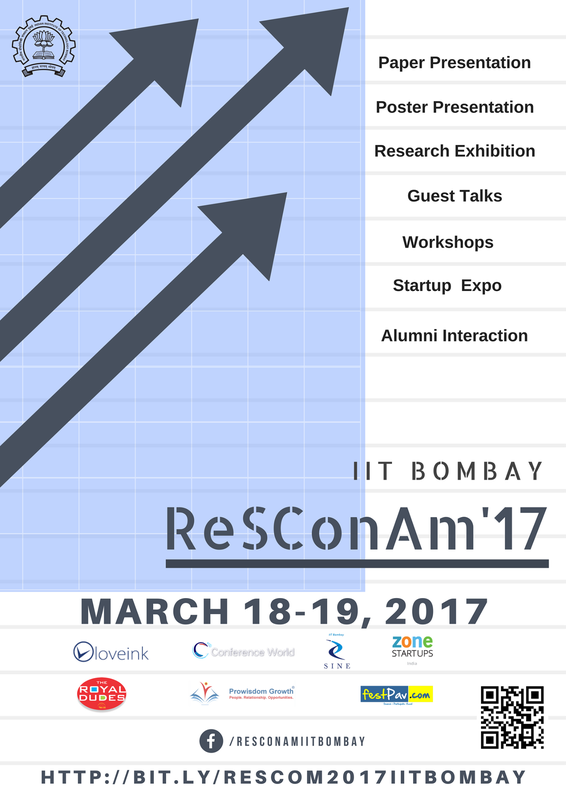 IIT Bombay brings back to you its biggest research festival Research Scholar Confluence and Alumni Meet (ReSConAm). Researchers from all over are invited to become the part of the largest research confluence. ReSConAm is a worldwide scientific research confluence for all Universities, bodies of National & International interests, famous laboratories, research centres of excellence, Research institutes, companies industries and publication houses. ReSConAm provides participating researchers an opportunity to interact with eminent scientists, industrialists, policy makers and leaders from prestigious institutes, universities, industries and scientific governing bodies, books and their publishers as well as distinguished alumni of IIT Bombay itself. ReSConAm is also the best platform to showcase your expertise & research to intellectual scholarly audience who will be hailing from several elite institutions, R&D departments of several organisations, industries, companies, academics, entrepreneurs, NGOs, government bodies across the defined boundaries. Breakout sessions and roundtable discussions will provide unique networking opportunities along with deeper knowledge exchange. Abstracts are invited from students & participants for paper and poster presentation, to present their research / research project or their research interests or current research and participate at large for this global Symposium of IIT Bombay. All the participants can apply for accommodation in the campus of IIT Bombay during the conference. However it is subject to availability and early birds will be given preference.